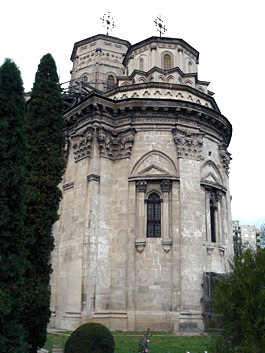 The church of Golia Monastery. 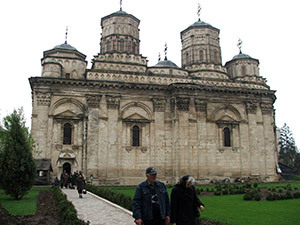 Raised on the spot of a religious building from the sixteenth century, Golia Monastery’s Church was built between 1650 – 1653, during the reign of the ruler Vasile Lupu and of his son, Stefanita Voda. The monastery is surrounded by a stone wall, with towers at the corners, and also a bell-tower, 30 meters high, with 120 steps. By the end of the nineteenth century, the tower had a balcony where from a fireman watched over the city to give the alarm in case of fire. Nearby the tower, there was a pump since the period of Alexandru Moruzi, which has been put back into functioning during the summer of 2007. 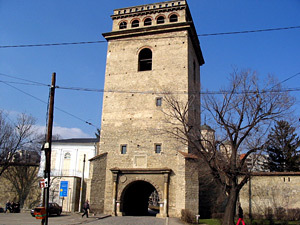 The belfry tower (30 meters height), from the entrance in the court of Golia Monastery. 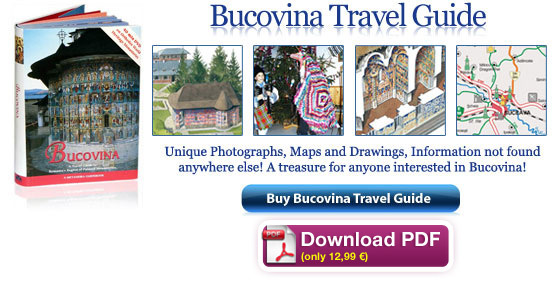 In the column house, built during the eighteenth century, lived temporarily the deacon Ion Creanga (the future writer who will buy a house in the neighborhood Ticau, known as “Bojdeuca lui ion Creanga” –Ion Creanga’s Hovel). The monastery was closed between 1900 -1947, and then it became parochial church until 1992 when it was reopen as missionary monastery. Inside, from the initial furniture there are still preserved: the royal thrones, a candelabrum bearing the marks of Vasile Lupu and four candlesticks. Many funerary stones and tombs from the pronaos and church’s porch show church’s importance during the past centuries. It’s also here that are buried part of the earthly remains of prince Potemkin, by 1791, and the first earthly ruler, after the Phanariots, Ioan Sandu Sturdza, by 1842. 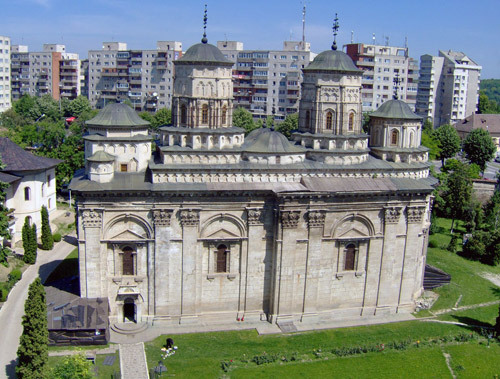 More than that, inside Golia Monastery’s Church were officiated the royal marriage ceremonies of Constantin Duca and Maria Brancoveanu, in 1693 and that of Antioh Cantemir with Catrina, in 1696, by the patriarch of Tzarigrad, Iacov. 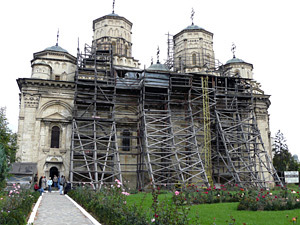 The church of the Golia Monastery in a restoration process. 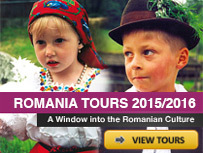 Today, Golia Monastery is a reference point for the citizens of Iasi but also for those visiting this city of Moldova. Monastery’s buildings shelter Trinitas Cultural-Missionary Institute, made up of the publishing house, the printing house and, since the spring of 1998, the radio Trinitas, broadcasting on the frequency 92,70 MHz, 24 hours a day. Golia Monastery has three dedication days: Lord’s Resurrection (40 days after the Holly Easter), The Source of Healing (Friday, during the Bright Week/Renewal Week) and the Holly Trinity (second day of the Whitsuntide). 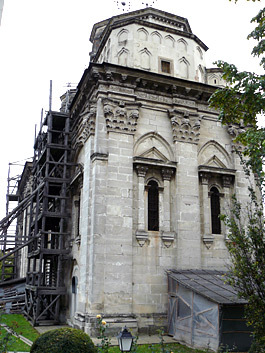 The church of the Golia Monastery. What does the word “Golia” mean?